.:. 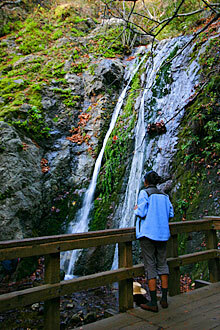 Hiking in Big Sur - Pfeiffer Falls & Valley View Trails .:. There are two places to begin the Pfeiffer Falls & Valley View hike, depending on where you parked. If after paying the fee and entering the park you turned right towards the lodge front desk, and parked in the lot opposite the gift shop and lobby, then you'll want to head up the road that goes east directly away from Highway 1 into the forest. Just a few yards up this road will be a sign on the right marking the start of the trail from this point. (You can also stay on the road and pick up the trail after a hundred yards or so). If you entered the park and went straight past the lodge and continued on, there are several parking lots on your right. You'll want to back track along the road and look for the trail entrance on your right opposite the lodge. The wide and well-maintained trail begins with a modest climb through the majestic redwoods, walking among the patches of clover-like redwood sorrel along the creek. After a short distance, you'll see where the trail crosses a bridge to the left to start up the side of the canyon. After a short steep climb you'll see the spur to the Valley View overlook to the left. It's another steep but short climb to the top where a viewing bench has been placed in a perfect spot for looking northwest out to the ocean. Surprisingly, cell phone service (at least Verizon and ATT which I've used) works great up here, and the overlook may be a fun place to call your pals at home and make them wish they were with you. Also notice the splendid examples of native oak trees along this part of the trail, especially up along the ridge to the lookout bench. From the lookout, head back down to the fork and this time go left towards the falls. The trail will wind down the hill and eventually drop you back into the redwoods where you'll cross over the creek one last time and see the falls on your left. After checking out the falls, you'll head back the way you came and go left at the fork, returning to the lodge and parking lot. 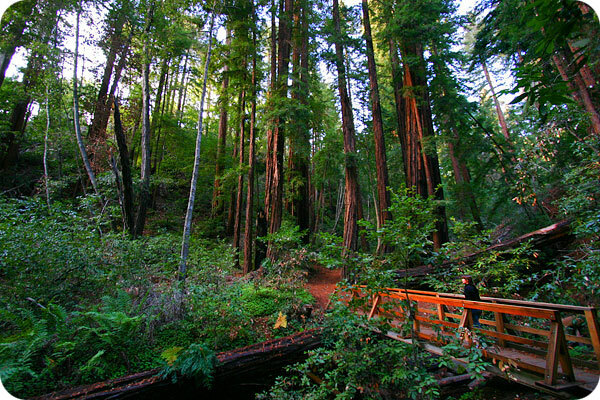 The beginning of this trail is in the Pfeiffer Big Sur State Park. Look for the main entrance sign on the inland (east) side of Highway 1 about 26 miles south of Carmel, or 63.5 miles north of the Hearst Castle turnoff.